Xiaomi is the leading mobile phone manufacturing company and this company has launched its recent smart phone, Xiaomi Redmi 5 Plus, which is the successor of popular Redmi 5 and this smart phone has the bigger display and the same classy design. The display unit of the handset, Xiaomi Redmi 5 Plus is 5.99 inch full HD+ (1080 x 2160p) resolution IPS LCD and has the aspect ratio of 18:9. When you compare the display of Redmi 5 you will find it larger and has sharper resolution. The display, size and processor of Redmi 5 Plus is also same as the predecessor and it is added with rear mounted finger print sensor. The display of the handset has the protective layer of Corning Gorilla Glass. Xiaomi Redmi 5 Plus is provided in the market with Qualcomm Snapdragon 625 processor and it is provided with 3 or 4 GB RAM. The handset has the internal storage option of 32 GB, which is paired with 3 GB RAM and 64 GB is paired with 4 GB RAM and they can be expanded up to 128 GB through the addition of hybrid dual SIM slot or the microSD card slot. The camera of Redmi 5 Plus can record up to 4K at 30 FPS and the camera of Redmi 5 manages up to 1080p. Both the primary and front cameras are same. The rear camera sensor is 12 MP with PDAF and dual tone flash. It has the front camera of 5 MP shooter. Redmi 5 Plus comes with Android 7.1.2 Nougat and an Oreo updates is not provided in it. The MIUI9 is nippy and it has some handy features. 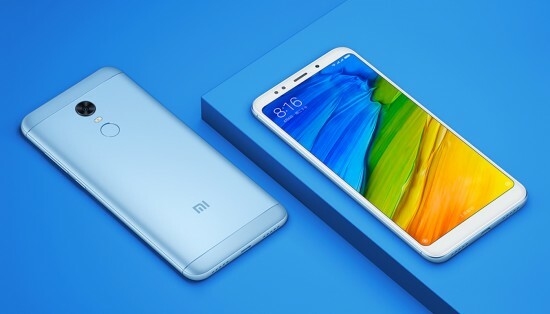 The battery capacity of the handset is 4000 mAh and the battery of Redmi 5 has 3300 mAh and it is chargeable through microUSB 2.0 but the fast charging is not available. The handset has the 3 GB with 32 GB variant, which has the cost of Rs.20,000 and 6 GB with 64 GB option has the price of Rs.26,000. This handset is available in the market in the colors like black, Gold and sky blue. The 4/64 GB was not provided in Pakistan.